These days there is such a rich offering of TV dramas that it can be hard to know what to watch and what not to. It can be difficult for new dramas to grab our attention, especially in world where shows like True Detective and Game Of Thrones dominate our viewing time. The BBC, once a home to the best television drama on offer has waned in the enormous shadow of HBO in recent years. However, their latest show, a seven-part series based on Susanna Clarke’s best-selling 2004 novel, Jonathan Strange & Mr Norrell, is truly unmissable TV. Clarke produced a behemoth of a novel, richly weaving the complex history of English magic set during the Napoleonic Wars. Her world is loaded with footnotes that detour into a vast mythology that is on a par with Rowling or Tolkien. Tackling such a vast plot and fully realising the universe she has fashioned on screen is no small feat. Peter Harness – who was tasked with the adapting the book – has delivered with aplomb and, with director Toby Hanes, has created a show that is like a Gothic mash-up of Harry Potter and Jane Austin, drenched in the macabre atmosphere of traditional fairy tales like those of Grimm and Basile. From start to finish it is a rapturous adventure that you don’t want to end. 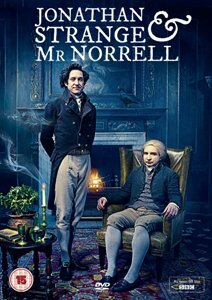 Norrell, played by Eddie Marsan, is a reclusive bibliophile who hoards his books of magic in his grand manor in Yorkshire until he decides to bring about the restoration of English Magic. Heading to London with his servant Childermass (Enzo Cilenti on superb form) he encourages the heads of state that magic will help them win the war against the French. To make English Magic respectable, Norrell decides to employ the use of a fairy (a form of magic that he finds utterly distasteful) to resurrect the wife (Alice Englert) of Sir Walter Pole (Samuel West) in order to win favour. Norell’s decision to use faerie magic brings him into contact with The Gentleman (Marc Warren), a well-coiffured creature with thistle-down hair who promises to help Norrell, but at a heavy price. Then there is Strange, played by the sublime Bertie Carvel. He is a bumbling figure, hair shocking out of his head, who, in a effort to impress his would-be wife Arabella (Charlotte Riley), decides to embark on a career as a magician by becoming Norrell’s student. The character in Carvel’s hands becomes a witty, sharp and wild figure, and will satisfy even the most avid fans of Clarke’s book. Both he and Marsan prove themselves to be generous in performace, delicately balancing Strange’s gun-ho approach to magic and Norrell’s fuddy-duddy peevishness. Watching them together on screen is like watching an artist and a scientist discuss the merits of a rose, one focusing on the aesthetic qualities, the other the botanical marvel of it all. More marvellous still is the way that Jonathan Strange & Mr. Norrell makes the idea of magic in England totally believable within its historical context. We are plunged into Georgian England where we witness bickering in the Commons between Whigs and Tories, and the Iron Duke marching across the planes of Spain in a bid to beat the French. Then we will detour into the land of Faerie, where spiteful sprites hold nightly balls in ruined castles, stealing away English ladies on a whim. These worlds subtly converge, to the point where it seems perfectly normal that Strange would resurrect bloodied and battered Italian corpses from the battlefield, or that Norrell would make decoy warships out of the rain. The visual effects are draw dropping. Giant horses made out sand charge into the sea to save a wrecked ship; mirrors become doorways to the other lands; and towers made of night stretch up to the heavens. While the show never lacks spectacle, it is the nuanced approach to a diverse range of subjects that will make sure that Jonathan Strange & Mr. Norrell will be remembered. One of many subplots focuses on Stephen Black played by Ariyon Bakare. Stephen is a freed slave put under an enchantment by The Gentleman, who insists that Stephen will one day be king, and that he will tell him his true name that was whispered by Stephen’s mother when she was gave birth to him on a slave ship. It’s a heart-wrenching story, bringing home the cruelty and barbarity of the slave trade, and what it was to be a black freeman in Georgian England. There are many examples throughout the show that tackle the most complex and difficult subjects in engaging, smart ways. It seems that Jonathan Strange & Mr. Norrell is, in every sense, a magical series loaded with an addictive plot, myriad beguiling characters, set in a fully realised world that is a treat from beginning to end.